The Austrian international gallerist Thaddaeus Ropac and the American Larry Gagosian set up their new galleries in 2012 in Pantin and Le Bourget respectively. Large buildings are still available in these former industrial districts in which monumental works can be exhibited without any space limitation. In Pantin, Thaddaeus Ropac has chosen a 19th century sheet metal factory. The gallery is located in a charming paved courtyard. It consists of three large red-brick buildings with natural vertical light streaming down through glass windows overhead. Art collectors as well as art lovers can admire contemporary works in these magnificent 2000 m². Several cultural venues are located nearby in Pantin: the National dance center, la Philharmonie de Paris, La Dynamo de Banlieues bleues…Thaddaeus Ropac gallery is accessible by metro. In Le Bourget, Larry Gagosian established his new gallery in an industrial airport building re-modelled by the famous architect, Jean Nouvel. Monumental contemporary works of art can be exhibited in this space of 1,650 m². This new gallery is located near the most important airport for business aviation in Europe (30,000 landings per year). Thus, art collectors can easily get to the gallery by private plane. This gallery is also open to simple art enthusiasts. Other contemporary art centers are located in North-East Paris. They promote ambitious artistic creations with artists-in-residence and carry out cultural mediation projects for the inhabitants, school children or visitors. In 2017, The CNEAI, National Contemporary Art Center moved in Magasins Généraux in Pantin. At the end of 2018, a new actor of the contemporary art will open its doors in Romainville : The Fiminco Fondation. Contemporary art is one form of art proposed in several multidisciplinary venues: La Maison populaire in Montreuil, Mains d’oeuvre in Saint-Ouen, Le Cent Quatre, or Untilthen gallery in Paris 10th. Other venues present temporary or permanent contemporary art works. The “Musée d’art et d’histoire” of Saint-Denis puts on video art exhibitions. 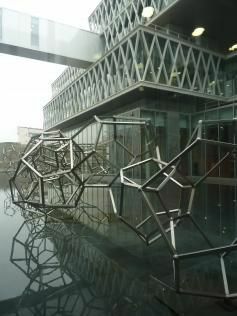 The National Archives building in Pierrefitte is a work of art in itself with artists invited to create sculptures outside. Alternative cultural venues have become apparent in North East Paris for some time now. They are home to artists’ workshops, contemporary art exhibitions and art performances in industrial areas or wasteland. For example you can find contemporary art in La Defense.